​Meet me at the Blog here! ​ Great story on the Watkins College of Art Website (here) where I am proud to be a Community Education Instructor! Watkins is a long time Nashville, Tennessee fixture in the art community. ​Follow my brushes through the garden and into the wild. What began as a series of miniature flowers in oil evolved into miniature bird paintings which has now evolved into a flat out obsession. Nature has held my fascination since childhood. Between walks in the woods with my great aunt to identify birds, to toddling behind my grandmother in her vast flower gardens, or camping trips with my parents, nature has been ingrained in my DNA. Its only natural for birds, flowers and nature to become the passion in art. The birds and flowers have moved on from the miniatures to larger canvases and from single birds to groups of birds. Initially, the mini paintings were the answer to a request which quickly evolved into a passion. The flowers were the start, followed by the birds. The flowers, butterflies and birds at first were the ones growing in my garden or visiting my feeders, as the passion has grown, I am painting more birds and nature from the wild. Lately, my camera and I are out and about exploring in the botanical gardens, wildlife refuges, parks and other wonderful places. New and bigger paintings are in the works! The blog is where I share what I learn out and about in the wild or in the studio. Years of teaching painting has led to a desire to able to share with new and former artists who've taken my classes. Its also share time. Please share with me through the blog! Current healthcare projects are focused on the development of comic books for patient education, though the Art To Heart Project remains alive and cooking. For more information about the Art in Healthcare projects please contact me through the contact page here. ©Mary Gwyn's Art, Mary Gwyn Bowen and Painting Pundit (2013). Unauthorized use and/or duplication of this material without express and written permission from this site’s author and/or owner is strictly prohibited. 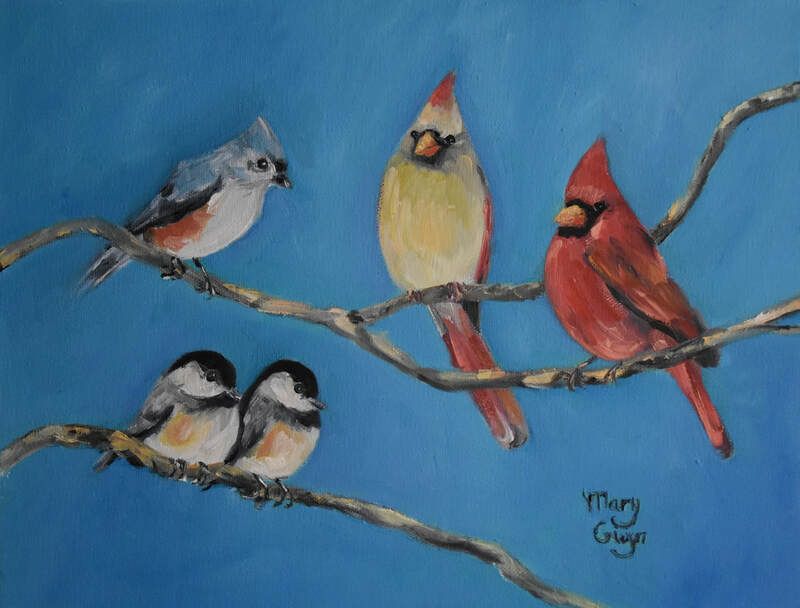 Excerpts and links may be used, provided that full and clear credit is given to Mary Gwyn Bowen and Mary Gwyn's Art,LLC with appropriate and specific direction to the original content. All photos, videos, and art on this site are created by and the property of Mary Gwyn Bowen and MaryGwyn'sArt, LLC unless otherwise stated.